This article is about the major scale B. For the R&B artist, see Bei Maejor. B major (or the key of B) is a major scale based on B. The pitches B, C♯, D♯, E, F♯, G♯, and A♯ are all part of the B major scale. Its key signature has five sharps. 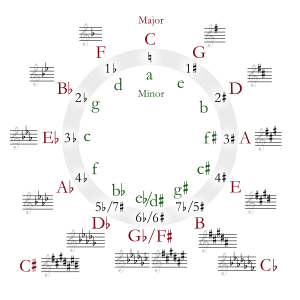 Its relative minor is G♯ minor, its parallel minor is B minor, and its enharmonic equivalent is C♭ major. Although B major is usually thought of as a remote key (due to its distance from C major in the circle of fifths and its fairly large number of sharps), Frédéric Chopin regarded its scale as the easiest of all to play, as its black notes fit the natural positions of the fingers well; as a consequence he often assigned it first to beginning piano students, leaving the scale of C major until last because he considered it the hardest of all scales to play completely evenly (because of its complete lack of black notes). There are a few large-scale works in B major: Joseph Haydn's Symphony No. 46 is in B major. The aria "La donna è mobile" from Verdi's opera Rigoletto is in B major, as is the "Flower Duet" from Lakmé. Johannes Brahms's Piano Trio No. 1, Op. 8 is in B major, though the piece ends in B minor. He also wrote the slow movement to his Second Symphony in B major, as well as the fourth and last piece of the Ballades, Op. 10. The Tuileries movement from Mussorgsky's Pictures at an Exhibition is in B major. Vanessa Carlton's 2002 hit "A Thousand Miles" is performed in the key of B major.